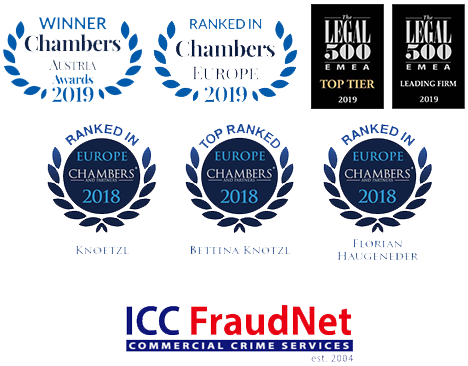 KNOETZL is a leading Austrian law firm founded on a handshake by some of the most effective, experienced and perceptive legal minds dedicated to providing the highest quality of advocacy in dispute resolution and corporate crisis. Our mission is to achieve optimal outcomes for corporate, financial and governmental clients in their most significant and complex disputes. With an all-star team, combined with a diversity of styles and specialisms, we’re here to deliver new standards of excellence in the market. We bring an agile, focused team, dedicated to developing and implementing cohesive strategies and cutting-edge thinking in collaboration with clients. Our team is seasoned; we believe that senior lawyers deliver better value-for-money. Put simply, we’re tough, smart and know how to win your case. You will be represented by Austria’s finest dispute resolution team; our lawyers have developed and led the market here. You will receive highly-crafted, quality counsel built around transparent fees and an emphasis on value, all delivered by prolific experts and progressive thinkers. We have the flexibility to offer a tailored team and price. If you’re looking for the very best representation in disputes by those who do nothing else, you need look no further. Read the Elements of our Firm. Search by lawyer name, service or sector to find our specialists or view our full team. We tackle complex work effectively and efficiently. Competence, reliability, and professionalism are all strong characteristics of our people and our working environment is non-bureaucratic and flexible. We truly believe in teamwork, but we also understand that clients want their team to be the right size for their case. We’re happy to go the extra mile because our work is highly fulfilling and meaningful. Our open and inclusive culture provides a unique environment where talent can really thrive and our people have the support and encouragement to progress in their careers. Bettina Knoetzl is a pre-eminent name in the asset recovery litigation space who is highly rated for her work in complex disputes. Bettina Knoetzl is a "top lawyer" who is very active on both the civil and criminal sides". She is "very well known" for her "efficient and reliable" service. Emmanuel Kaufman is a disputes specialist who receives widespread plaudits for his excellent work handling high-stakes international construction claims. Emmanuel Kaufman is "a smart, efficient and hard-working lawyer" and draws praise for his strong experience across Latin America. WWL says: Bettina Knoetzl boasts "a plethora of experience" defending some of the world's best-known pharmaceutical companies and wins praise for being "an excellent strategist". Bettina Knoetzl is a leading litigator, celebrated for her outstanding experience of disputes, including cross-border conflicts. She is described as a top-level expert who is always “on top of the facts” and has "substantial creativity in conducting the litigation." Founding partner of a new firm in 2016, KNOETZL, Bettina Knoetzl is a prized litigator covering both commercial and criminal cases at the highest standard. She heads the firm's white-collar crime division and advises large corporates in domestic and cross-border investigations and proceedings. Bettina Knoetzl is praised as a "simply outstanding litigator" with "a host of leading international clients", which include goverments, companies and investor clients. Her skills in asset tracing and recovery are unsurpassed and we recognise her with the Asset Recovery Laywer of the Year award. Emmanuel Eugenio Kaufman is an increasingly visible and highly regarded arbitration lawyer. Clients state that he "is very particular in his assessments and has attention to detail whilst not losing sight of the big picture." Florian Haugeneder is "strongly recommended" by practitioners across Europe, as well as Canada and the USA for his dispute resolution work in the construction sector. Emmanuel Kaufman is particularly recommended for his leading international arbitration practice, which features deep experience in the construction field. Bettina Knoetzl is a “true star” in the field. Head of the firmwide dispute resolution practice she is “greatly admired” by peers and clients alike and is described as a “smooth operator”. Team head Bettina Knoetzl is “frank and outspoken” … One satisfied client relates how “they mastermind the strategy, developing the big picture and managing to lift the case from a low chance to a 50:50 case”. Bettina is the President of the Advisory Board of Transparency International – Austrian Chapter (TI-AC), and since 2013, she is the Senior Vice Chair of the Litigation Committee of the International Bar Association. Bettina specializes in international litigation and commercial litigation, focusing on business crime, including asset tracing, FCPA, UK Bribery Act, and fraud investigations, investor protection, liability claims, corporate disputes, and compliance issues. She has more than 20 years of experience in international dispute resolution and built the firm-wide dispute resolution practice group to its current size as the market leader (in Austria). …expertise of Bettina Knoetzl who heads the dispute resolution practice and is of particular advantage to clients in health sectors facing product liability actions. [The team] quickly ‘adapts to changing, complex circumstances’ and has ‘a wide spectrum of capability’. The key focus is on commercial disputes, although the team has also developed an alternative dispute resolution practice, particularly in mediation. New head of arbitration Florian Haugeneder took over from Christoph Liebscher, who left the firm to work independently. Patrizia Netal has been associated with the organisation of the Willem C. Vis International Commercial Arbitration Moot for more than 15 years, and since 2012 as a Director. In 2012, Format nominated Patrizia to first place in the category “the most sought for in the next generation of lawyers”. Many companies state diversity, excellence, partnership and integrity as their values, but hearing Bettina Knoetzl speak about them, the team and their ambitions, assures you that at Knoetzl, these words determine the company’s very essence. I consent to KNOETZL storing and processing my submitted information to respond to my inquiry.